Received April 5, 2018; Revised June 13, 2018; Accepted June 14, 2018. Ubiquitination of proteins plays an essential role in various cellular processes, including protein degradation, DNA repair, and cell signaling pathways. Previous studies have shown that protein ubiquitination is implicated in regulating pluripotency as well as fate determination of stem cells. To identify how protein ubiquitination affects differentiation of embryonic stem cells, we analyzed microarray data, which are available in the public domain, of E3 ligases and deubiquitinases whose levels changed during stem cell differentiation. Expression of pja2, a member of the RING-type E3 ligase family, was up-regulated during differentiation of stem cells. Wnt/β-catenin signaling is one of the most important signaling pathways for regulation of the self-renewal and differentiation of embryonic stem cells. Pja2 was shown to bind to TCF/LEF1, which are transcriptional factors for Wnt/β-catenin signaling, and regulate protein levels by ubiquitination, leading to down-regulation of Wnt signaling activity. Based on these results, we suggest that E3 ligase Pja2 regulates stem cell differentiation by controlling the level of TCF/LEF1 by ubiquitination. Embryonic stem cells (ESCs) have pluripotency and differentiation capacity, which are useful for various clinical applications (1, 2). Regulation of stemness and differentiation of ESCs have been major goals of researchers for decades. Treatment with small molecules or recombinant proteins as well as overexpression or knockdown of proteins involved in various signaling pathways have been utilized for regulation of ESC differentiation (3–7). For differentiation of ESCs, expression levels of numerous proteins must be sufficiently altered in order to overcome the differentiation barrier at an early stage. To overcome this barrier, we hypothesized that levels of proteins specifically related to maintenance of stemness should be down-regulated. E3 ligases and deubiquitinases (DUBs) play crucial roles in the regulation of protein levels by proteasomal degradation (8). We analyzed publically available microarray databases and searched for E3 ligases whose levels were altered during differentiation. Pja2 is a RING domain E3-ubiquitin ligase that is expressed in most mammalian tissues. Originally, pja2 was named as Neurodap1 due to its function related to neurodegeneration (9, 10). Pja2 participates in several signaling pathways as a protein regulatory factor. Upon cyclic AMP stimulation, pja2 ubiquitinates the regulatory (R) subunit of PKA, which plays an inhibitory role against PKA activity. Induced proteasomal degradation of R-subunit by pja2 promotes cAMP-mediated target gene expression (11). Pja2 also regulates hippo signaling via ubiquitination-dependent proteolytic degradation of mob1, which causes inhibition of Lats1/2. Inhibition of Lats1/2 enhances expression of yap target genes. Finally, overexpressed pja2 induces cell proliferation in human glioblastoma (12). However, the function of pja2 in stem cell differentiation remains elusive. Wnt signaling has been described as a regulator of ESCs, although its role in ESC differentiation is still debatable. Activation of Wnt signaling is required for various types of stem cell maintenance and differentiation (13, 14). However, according to several reports, transcriptional activity of β-catenin does not play a role in mouse ESC differentiation (15). Activated Wnt signaling induces nuclear translocation of β-catenin, which proceeds to interact with the transcription factors TCF/LEF1 and enhance expression of their target genes. The levels of TCF/LEF1 are regulated at multiple stages from transcriptional regulation to post-translational modification (16–19). Here, we report an inverse correlation between the levels of pja2 and TCF/LEF1 during differentiation of mouse ESCs and provide an evidence that pja2 is an E3 ligase for TCF/LEF1. Our data suggest that pja2 interacts with TCF/LEF1 and enhances ubiquitin-mediated proteasomal degradation of TCF/LEF1. Mouse E14 embryonic stem cells (mESCs) and human embryonic kidney HEK293T cells were used for the experiments. mESCs were cultured on tissue culture plates (Sigma) pre-coated with 0.2% gelatin at 37°C in a 5% CO2 incubator. Cell culture media are consisted of 15% fetal bovine serum (FBS, Biowest), 1 mM sodium pyruvate (GIBCO), 100X non-essential amino acid (Corning), 0.1 mM β-mercaptoethanol (GIBCO), 100X GlutaMAX (GIBCO), Tylosine (Sigma), and 1,000 U/mL of LIF (conditioned media). LIF-containing media were produced from Cos7 cells transfected with LIF cDNA by Lipofectamine. Subculture was performed by 0.01% trypsin treatment for 3 min in a 37°C incubator. After incubation, trypsin was neutralized by FBS-containing media, and mESCs were collected by centrifugation. Subsequently, mESCs were plated on a pre-coated culture dish. HEK293T cells were maintained on a SPL tissue culture plate with Dulbecco’s Modified Eagle’s Medium (DMEM). Media contained 10% fetal bovine serum (FBS, Gibco) and 1X antibiotics (anti-anti, Gibco). Subculture was performed with 0.05% trypsin. Cells were re-suspended with FBS-containing media for neutralization and re-plated on a tissue culture plate. Calcium phosphate method was used for plasmid DNA transfection. Differentiation of mESC was induced by removing LIF from culture media. The media for mESC were substituted with media without LIF 1 day after subculture. Every 2 days, media were exchanged with fresh media. mRNAs from E14 and HEK293T cells were isolated by TRIzol (Thermo Fisher) according to the manufacturer’s protocol. RTase mastermix (TOYOBO) was used for cDNA synthesis. qPCR was performed by using CFX Connect™ real-time PCR (BIO-RAD) with SYBR qPCR mix (TOYOBO). Cell lysates were prepared in lysis buffer (20 mM Tris-HCl pH7.5, 150 mM NaCl, 1% Triton X-100, 1 mM EDTA, 1 mM EGTA, 2.5 mM sodium pyrophosphate, 1 mM β-glycerophosphate, and 1 mM sodium orthovanadate). Lysates were immunoprecipitated overnight using the indicated antibody. Subsequently, immunoprecipitates were pulled down by protein A/G plus agarose beads (Santa Cruz). After elution by boiling, proteins were separated by SDS-PAGE and transferred onto a PVDF membrane. Each primary antibody was treated overnight with 5% BSA or 5% skim milk at 4°C. Mouse and rabbit secondary antibodies were treated for 2 hours at room temperature. Proteins were detected by MicroChemi 4.2 (DNR Bio-Imaging System). The following antibodies were used: anti-pja2 (Bethyl), anti-TCF1 (cell signaling), anti-LEF1 (cell signaling), anti-HA (Santa Cruz), anti-Myc (Abm), anti-Oct4 (Santa Cruz), and anti-Flag (Sigma). TOP-luciferase reporter plasmid, pRL-TK-Renilla, and the plasmids indicated in the figure were transfected into HEK293T cells plated on a 12-well plate. At 16 hours after transfection, luciferase assay was performed according to the manufacturer’s protocol (Promega, #E1960), and its activity was measured by a GLOMAX 20/20 luminometer (Promega). Transfection efficiency was normalized by pRL-TK-Renilla-mediated luciferase activity. We analyzed publically available microarray databases and searched for E3 ligases whose levels increased during differentiation. pja2 showed appropriate expression patterns in our analysis. To assess the validity of the observed increased in pja2 RNA expression in the microarray analysis, we differentiated mESCs by removal of LIF and performed quantitative real-time PCR. As shown in Figure 1A, pja2 RNA expression increased during mESC differentiation (Fig. 1A). Western blot showed that pja2 protein levels increased consistent with its RNA expression, while the level of Oct4, a marker for undifferentiated mESC, was decreased (Fig. 1B). These data indicate that pja2 mRNA and protein levels increased during mESC differentiation. Wnt signaling is known to play critical roles both in the maintenance of stemness as well as differentiation of ESCs. Reduced Wnt/β-catenin signaling initiates differentiation of mESCs. Thus, we hypothesized that Wnt signaling components can be putative targets of pja2. We tested this hypothesis by performing Wnt reporter luciferase assay. Ectopic expression of HA-tagged pja2 reduced relative luciferase activity under control (L-CM) or Wnt3a-conditioned media (Wnt3a-CM) conditions (Fig. 2A). To elucidate which components of the Wnt signaling pathway are targeted by pja2, additional reporter assays were performed. Each Wnt signaling activating component, including LRPΔN (constitutive active LRP), Dvl, β-catenin, TCF1, LEF1, and VP16-LEFΔN (constitutive active LEF1), was overexpressed with pja2. All luciferase activities induced by Wnt activating components were reduced by pja2 overexpression, and even VP16-LEFΔN-induced signaling was down-regulated (Fig. 2B). These results suggest that pja2 inhibited Wnt/β-catenin signaling at the same level or downstream of TCF/LEF1. Our data shown in Figure 2 suggest that TCF and/or LEF are putative targets of pja2. Thus, we examined the protein dynamics of pja2 and TCF/LEF during mESC differentiation. 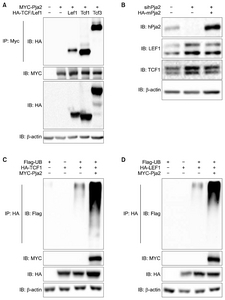 Results from the Western blot show that the levels of TCF1, LEF1, and Oct4 decreased during mESC differentiation. Interestingly, the level of pja2 showed an inverse correlation during mESC differentiation (Fig. 3). To regulate target proteins, E3 ligase should interact with its substrates. We then investigated the interaction between pja2 and TCF/LEF1. Immunoprecipitation analysis found that pja2 and TCF/LEF1 clearly interacted with each other (Fig. 4A). However, the inverse correlation protein dynamics and protein interaction data do not prove that pja2 inhibited the level of TCF/LEF1. Knockdown of human PJA2 by siRNAs increased both TCF1 and LEF1 levels in HEK293T cells, whereas co-transfection with pja2 plasmid, which contains a mutated sequence resistant to PJA2-specific siRNAs, reduced levels of TCF1 and LEF1 (Fig. 4B). Since ectopic expression of pja2 reduced the levels of TCF1 and LEF1, we tested whether or not pja2 could enhance ubiquitination of TCF1 and LEF1. MYC-tagged pja2 was transfected with HA-tagged TCF1 and LEF1 into HEK293T cells along with Flag-tagged Ub. Lysates were immunoprecipitated with anti-HA antibody and immunoblotted with anti-Flag antibody. 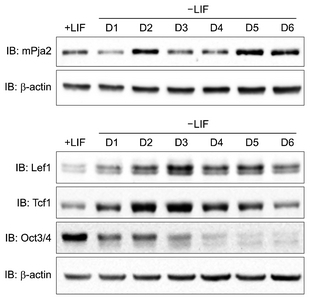 As shown in Figure 4C and 4D, TCF1 and LEF1 were more ubiquitinated by pja2 (Fig. 4C, D). Although further study is needed to verify that the level of TCF/LEF1 is directly down-regulated by pja2 during mESC differentiation, our current data indicate that pja2 interacted with and down-regulated TCF/LEF1 by enhancing ubiquitination. Embryonic stem cells can self-renew and differentiate into cells of three germ layers, including ectoderm, mesoderm, and endoderm. Discovery of proper controlling procedures for self-renewal and differentiation is a major goal for stem cell researchers. The lists of proteins expressed in undifferentiated and differentiated embryonic stem cells are obviously different. These differences are achieved by the regulation of differential gene expression at the transcriptional level as well as regulation of protein stability at the post-transcriptional level. Interestingly, ubiquitination levels of proteins dramatically increase during the transition from undifferentiated to differentiated mESCs (unpublished data). We propose that the rapid removal of undifferentiated stem cell-specific proteins might be mediated by the ubiquitin-proteasome pathway. Therefore, we searched for E3 ligases whose levels increased during differentiation by using microarray databases open to the public. Multiple candidates such as pja2 were identified. Levels of both pja2 mRNA and protein increased during differentiation of mESCs (Fig. 1). Our findings suggest that the E3 ligase pja2 definitely interacted with TCF/LEF1 and regulated their stability through ubiquitin E3 ligase activity. Since Wnt/β-catenin signaling is important for the regulation of stem cell differentiation, we tested whether or not pja2 could regulate Wnt/β-catenin signaling. Our data show that pja2 inhibited Wnt/β-catenin signaling by reducing the levels of TCF/LEF1. Interestingly, we observed an inverse correlation between the levels of pja2 and TCF/LEF1. Although further study is needed, our data suggest that Wnt/β-catenin signaling may be regulated during ESC differentiation by the E3 ligase activity of pja2 on TCF/LEF1. Pja2 also regulates Hippo signaling by reducing the level of mob1, which resulting in increased YAP/TAZ-mediated expression of target genes involved in proliferation and anti-apoptosis (12). Therefore, increased pja2 activity during differentiation of mESCs could lead to inhibition of Wnt/β-catenin signaling and activation of YAP/TAZ signaling, resulting in opposite effects when only considering the roles of these signaling pathways in the regulation of proliferation. However, as YAP was shown to be necessary for the differentiation of mESCs (20), it would be interesting to test whether or not pja2 controls differentiation of mESCs by regulation of both Wnt/β-catenin and Hippo signaling. This research was supported by the 2017 Research Fund of the University of Seoul to E. Jho. Fig. 2. Pja2 inhibits Wnt/<italic>β</italic>-catenin signaling. (A) Pja2 inhibits Wnt 3a-mediated reporter activity. TOP-Flash Wnt reporter construct was transfected with HA-pja2. Reporter activity was analyzed upon treatment with control and Wnt 3a-conditioned media. (B) Pja2 inhibits activator of Wnt signaling-mediated reporter activity. Reporter activity was measured after transfection with the indicated plasmids into HEK293T cells. **p<0.01. Murry, CE, and Keller, G (2008). Differentiation of embryonic stem cells to clinically relevant populations: lessons from embryonic development. Cell. 132, 661-680. Doetschman, TC, Eistetter, H, Katz, M, Schmidt, W, and Kemler, R (1985). The in vitro development of blastocyst-derived embryonic stem cell lines: formation of visceral yolk sac, blood islands and myocardium. J Embryol Exp Morphol. 87, 27-45. Ying, QL, Nichols, J, Chambers, I, and Smith, A (2003). BMP induction of Id proteins suppresses differentiation and sustains embryonic stem cell self-renewal in collaboration with STAT3. Cell. 115, 281-292. Kim, H, Kim, S, Song, Y, Kim, W, Ying, QL, and Jho, EH (2015). Dual Function of Wnt Signaling during Neuronal Differentiation of Mouse Embryonic Stem Cells. Stem Cells Int. Ying, QL, Wray, J, Nichols, J, Batlle-Morera, L, Doble, B, Woodgett, J, Cohen, P, and Smith, A (2008). The ground state of embryonic stem cell self-renewal. Nature. 453, 519-523. Sato, N, Meijer, L, Skaltsounis, L, Greengard, P, and Brivanlou, AH (2004). Maintenance of pluripotency in human and mouse embryonic stem cells through activation of Wnt signaling by a pharmacological GSK-3-specific inhibitor. Nat Med. 10, 55-63. Smith, AG, Heath, JK, Donaldson, DD, Wong, GG, Moreau, J, Stahl, M, and Rogers, D (1988). Inhibition of pluripotential embryonic stem cell differentiation by purified polypeptides. Nature. 336, 688-690. Nakayama, M, Miyake, T, Gahara, Y, Ohara, O, and Kitamura, T (1995). A novel RING-H2 motif protein downregulated by axotomy: its characteristic localization at the postsynaptic density of axosomatic synapse. J Neurosci. 15, 5238-5248. Yu, P, Chen, Y, Tagle, DA, and Cai, T (2002). PJA1, encoding a RING-H2 finger ubiquitin ligase, is a novel human X chromosome gene abundantly expressed in brain. Genomics. 79, 869-874. Lignitto, L, Carlucci, A, Sepe, M, Stefan, E, Cuomo, O, Nisticò, R, Scorziello, A, Savoia, C, Garbi, C, Annunziato, L, and Feliciello, A (2011). Control of PKA stability and signalling by the RING ligase praja2. Nat Cell Biol. 13, 412-422. Lignitto, L, Arcella, A, Sepe, M, Rinaldi, L, Delle Donne, R, Gallo, A, Stefan, E, Bachmann, VA, Oliva, MA, Tiziana Storlazzi, C, L’Abbate, A, Brunetti, A, Gargiulo, S, Gramanzini, M, Insabato, L, Garbi, C, Gottesman, ME, and Feliciello, A (2013). Proteolysis of MOB1 by the ubiquitin ligase praja2 attenuates Hippo signalling and supports glioblastoma growth. Nat Commun. 4, 1822. Nusse, R (2008). Wnt signaling and stem cell control. Cell Res. 18, 523-527.
ten Berge, D, Kurek, D, Blauwkamp, T, Koole, W, Maas, A, Eroglu, E, Siu, RK, and Nusse, R (2011). Embryonic stem cells require Wnt proteins to prevent differentiation to epiblast stem cells. Nat Cell Biol. 13, 1070-1075. Lyashenko, N, Winter, M, Migliorini, D, Biechele, T, Moon, RT, and Hartmann, C (2011). Differential requirement for the dual functions of β-catenin in embryonic stem cell self-renewal and germ layer formation. Nat Cell Biol. 13, 753-761. Roose, J, Huls, G, van Beest, M, Moerer, P, van der Horn, K, Goldschmeding, R, Logtenberg, T, and Clevers, H (1999). Synergy between tumor suppressor APC and the beta-catenin-Tcf4 target Tcf1. Science. 285, 1923-1926. Ishitani, T, Ninomiya-Tsuji, J, Nagai, S, Nishita, M, Meneghini, M, Barker, N, Waterman, M, Bowerman, B, Clevers, H, Shibuya, H, and Matsumoto, K (1999). The TAK1-NLK-MAPK-related pathway antagonizes signalling between beta-catenin and transcription factor TCF. Nature. 399, 798-802. Li, TW, Ting, JH, Yokoyama, NN, Bernstein, A, van de Wetering, M, and Waterman, ML (2006). Wnt activation and alternative promoter repression of LEF1 in colon cancer. Mol Cell Biol. 26, 5284-5299. Cadigan, KM, and Waterman, ML (2012). TCF/LEFs and Wnt signaling in the nucleus. Cold Spring Harb Perspect Biol. 4, a007906. Chung, H, Lee, BK, Uprety, N, Shen, W, Lee, J, and Kim, J (2016). Yap1 is dispensable for self-renewal but required for proper differentiation of mouse embryonic stem (ES) cells. EMBO Rep. 17, 519-529.